It can be hard to face the fact that a disability can happen at anytime, to anyone; your clients without high limit disability insurance could potential face huge financial losses. Your clients need to protect themselves and their families from the ruinous fiscal consequences of a debilitating injury or illness. Personal Disability Insurance allows people to not only continue fostering their children’s quality education and put three well balanced meals on the table, but to continue living in the manner to which they have become accustomed. If your clients are properly insured, they can continue living comfortably in the face of a temporary or permanent disability. Don’t let your clients go uninsured (or underinsured) because of age. Let Petersen International help you find a solution. When every day personal expenses are suddenly unfunded, saving accounts dwindle rapidly; when there is no monthly income it will become difficult for your clients to support their families, maintain their houses, and sustain their lifestyles. Unfortunately, traditional disability carriers cannot provide everyone with the personal disability coverage they require. Some people are deemed uninsurable because of their age, their employment in a risky occupation, the location of their workplace, their medical history, an avocation for risky behavior, frequent international travel, or simply the need for a high limit disability plan that a traditional carrier won’t underwrite. 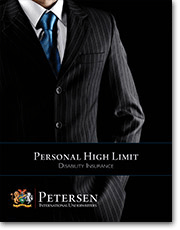 Petersen International Underwriters offers many high limit disability plans designed for your clients who are not satisfied with coverage from the traditional market. Our plans are custom designed for your clients from all industries and financial backgrounds. At PIU we do not intend to compete with traditional disability carriers; we aim to supplement coverage where needed, and to offer coverage when other carriers cannot. Keep your clients and their families financially secure with one of our tailored high limit personal disability plans.